On the sample page you’ll find a link to open a live app, additional information on how to customize the sample, and a link to download the source. Below we’ve downloaded the source files, copied them to our website, and opened the application. 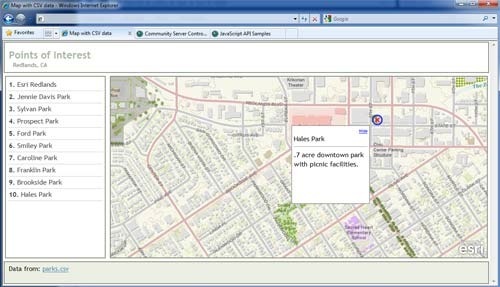 The sample opens a CSV file of parks in Redlands, California, and uses the lat/long location in the CSV file to place points on the ArcGIS Online map. Click on a park in the contents or on the map to view more details in a popup window. The locations, names, and other information have come from the CSV file. We’ll use this sample and modify it to use our own map and CSV file. First we authored a new ArcGIS Online map by opening the ArcGIS.com viewer and added the USA Social Vulnerability Index map service. We switched basemaps to the Shaded Relief basemap (found on the basemap gallery) and adjusted the transparency of the social vulnerability layer to about 50% so we could see the terrain. We then saved our map, and shared it publicly. We’ll use this map ID when we edit the sample code. Next we’ll need a CSV file. 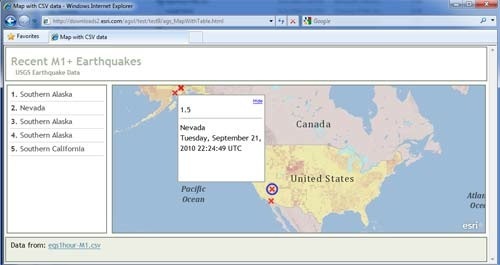 We visited the USGS earthquake site and downloaded a CSV file of magnitude 1+ earthquakes in the past hour. Here’s the CSV file, and note that the field names are in the first line of the file. We’ll use the file and field names when we edit the sample code. 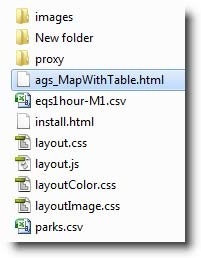 We’ll edit the ags_MapWithTable.html file (highlighted in blue above). The eqs1hour-M1.csv file found below it is the file we downloaded from the USGS site with earthquake information. //List of fields that includes the label field, latitude field and longitude field. //for the title and the details field will populate the info window. 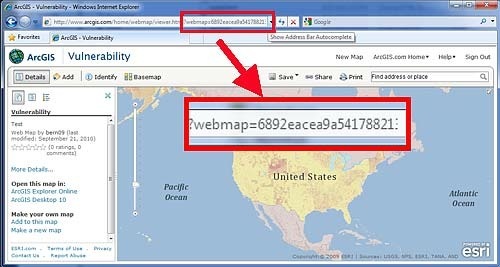 //The subtitle, if blank the description of the first layer in the webmap is used. 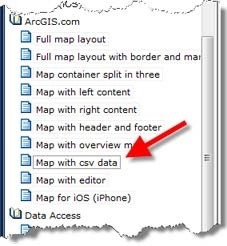 Here’s a summary of the changes to make: insert a new map ID, change the name of the CSV file, change the field names used in the defaultFields and defaultInfoTemplate (popup window) lists, and change the title and subtitle – all very easy and straightforward edits. Now we’re ready to open our custom application.